Barack Obama's mother has been a subject of considerable interest ever since, as a relatively unknown first-term Senator, he announced his bid for the Presidency of the United States. Since that time, journalists have searched three continents to provide voters with answers to the question "Who is Barack Obama?" One of the interesting things about Barack Obama is that he is appealing to the black voters of America as a black man, yet he was raised by a single mother and her parents, all of whom were white. In a well-researched article published in Time, Amanda Ripley explains, "In most elections, the deceased mother of a candidate in the primaries is not the subject of a magazine profile. But Ann Soetoro was not like most mothers." She points out: "Each of us lives a life of contradictory truths. We are not one thing or another. Barack Obama's mother was at least a dozen things. S. Ann Soetoro was a teen mother who later got a Ph.D. in anthropology; a white woman from the Midwest who was more comfortable in Indonesia; a natural-born mother obsessed with her work; a romantic pragmatist, if such a thing is possible." Barack Obama's mother was a very interesting and unusual woman, and, according to Ripley, he's very much his mother's son. 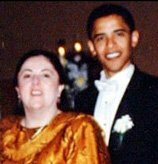 Barack Obama's mother, Stanley Ann Dunham Obama Soetoro (she later spelled it Sutoro) was a white woman from the Midwest who married and divorced not one, but two, foreign men (one from Kenya and one from Indonesia, both Muslim). She met Barack Obama Sr. in a Russian-language class at the University of Hawaii, where both were students. After one semester, at age 18 she dropped out of school and, three months pregnant, secretly married a man she met only a few months earlier. Young Barack was born August 4, 1961. At that time, interracial marriages were illegal in many states, and bi-racial children were ostracized by both ethnic groups as not "belonging" to either. When the infant Barack was not yet a year old, Obama Sr. left his new family for a Harvard scholarship to get a Ph.D. in economics. His eventual plan was reportedly to take his new family and return to rebuild Kenya. He already had a wife there, although there was some question about the legality of the earlier tribal marriage. Obama's mother decided she did not wish to go with him, and returned to her studies at the University of Hawaii while her parents helped care for her young son. In 1964, Barack Obama's mother filed for divorce from Obama Sr.
At the University of Hawaii, Ann met another international student, Lolo Soetoro, who proposed in 1967. Ann and young Barack followed him home to Indonesia. Obama's half-sister Maya was born in 1970. In 1971, when he was 10, Barack Obama's mother sent him back to Hawaii to live with her parents and attend an elite prep school on a scholarship arranged by Ann's mother, an executive at Bank of Hawaii. Obama lived with Ann's parents until he finished high school. Ann and Maya followed a year later. Ann once again enrolled in classes at the University of Hawaii. Although Lolo visited often, they never again lived together, and in 1980, Ann filed for divorce. According to Ripley, Ann maintained a cordial relationship with her ex-husbands, staying in touch with both men. It is probably safe to say, however, that Barack Obama had very little actual influence from either man in his life. His father left before he was a year old, and he lived with his mother and her second husband in Indonesia for only four years, from age 6 to 10, before being shipped back to Hawaii for prep school. This makes it even more remarkable that he has written a memoir titled, "Dreams From my Father." It has been reported that Barack Obama's mother read a draft of her son's book before her death in 1995. One has to wonder how disappointed she must have been to learn it was titled about a father who was never a part of his son's life. What a story he could have written about the strong and pioneering women who raised him! Barack Obama's mother studied anthropology in Indonesia, and helped thousands of poor women find better lives for themselves and their families. She is credited with helping to create the microfinance program in Indonesia, "which she did from 1988 to '92 —- before the practice of granting tiny loans to credit-poor entrepreneurs was an established success story. Her anthropological research into how real people worked helped inform the policies set by the Bank Rakyat Indonesia, says [her friend] Patten, an economist who worked there. 'I would say her work had a lot to do with the success of the program,' he says. Today Indonesia's microfinance program is No. 1 in the world in terms of savers, with 31 million members, according to Microfinance Information eXchange Inc., a microfinance-tracking outfit." Barack Obama's mother died in Hawaii in 1995, at age 52, of ovarian and uterine cancer. Her son, the future president, was not there. As you ponder the question, ""Who is Barack Obama?" reflect on the remarkable woman who was his mother. We found a warm remembrance of Obama's mother by one of her best friends in Indonesia. Scroll down the page, as the English version appears below. You'll find her description of Obama's political career at the beginning to be quite different from what appears in the American press. You may also be interested in the strong, pioneering woman who was Obama's "Tutu," the Hawaiian word for grandmother. The Honolulu Advertiser published remembrances of Obama's grandmother, Madelyn Dunham, who was one of the first two female vice-presidents at Bank of Hawaii, by those she mentored. More about Obama's extended family, including a number of photos. Return to top of Barack Obama's Mother.